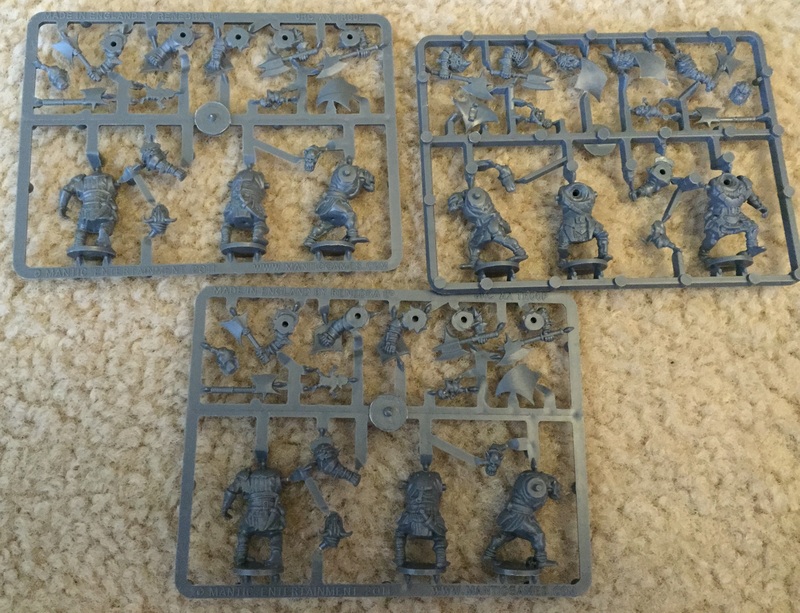 I always wanted an army of Chaos Dwarves for Warhammer Fantasy. Of course, neither a regular line of Chaos Dwarves or Warhammer Fantasy exists anymore. Sure, you can play older editions of Warhammer (5th Edition forever!) or buy the very expensive Forge World releases (which have Age of Sigmar Warscrolls), but Mantic has its own line of Abyssal Dwarves for Kings of War. Abyssal Wars will be my third army from the Kings of War, Second Edition Kickstarter, but the first that I have received. 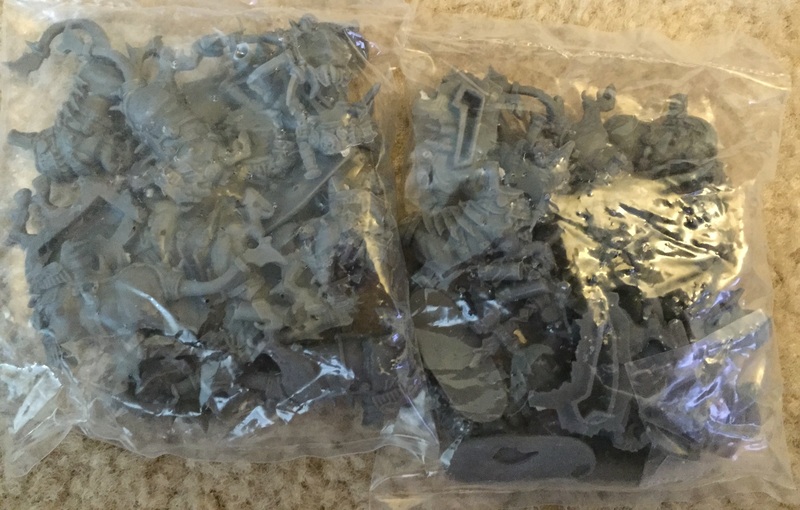 My actual order of Baslieans and Undead have not arrived yet due to production reasons, so Mantic just went ahead and sent me the Abyssal Dwarves. 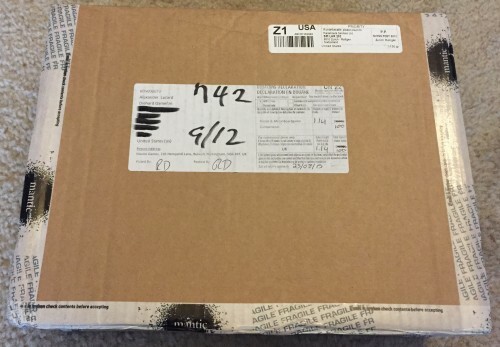 I’ve already reviewed the digital version of the rulebook, so I figure I might as well show you what was in the first of two or three packages from Mantic coming my way. 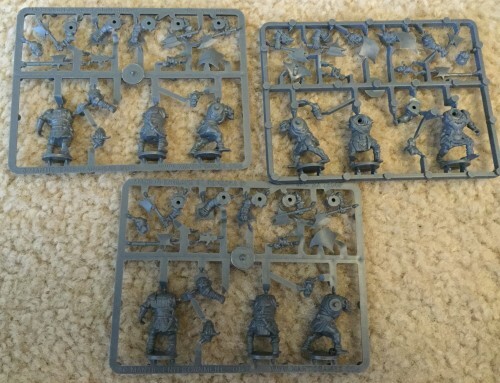 I’ll probably be painting these dwarves with a grey-ish purple skin, ala the Deugar from Dungeons & Dragons, rather than the Caucasian colors Mantic paints their Abyssal Dwarves in. What can I say? I like to do my own thing, and in this case, it looks like it’ll be UnderDark. Note that this unboxing doesn’t include the Abyssal Fiend or the Abyssal Dwarf Supreme Ironcaster on the Greater Winged Abyssal as both are part of Wave 2, which won’t be out for some time. Now, let’s look at a LOT of restic and a tiny bit of metal. A lovely little box in the post. It was much smaller than I was expecting. I guess because I’m used to the oversized Games Workshop packages, I thought the Abyssal Dwarves would take up a lot more room. The box once opened, complete with packing slip. The packing slip turned around so you can read it. 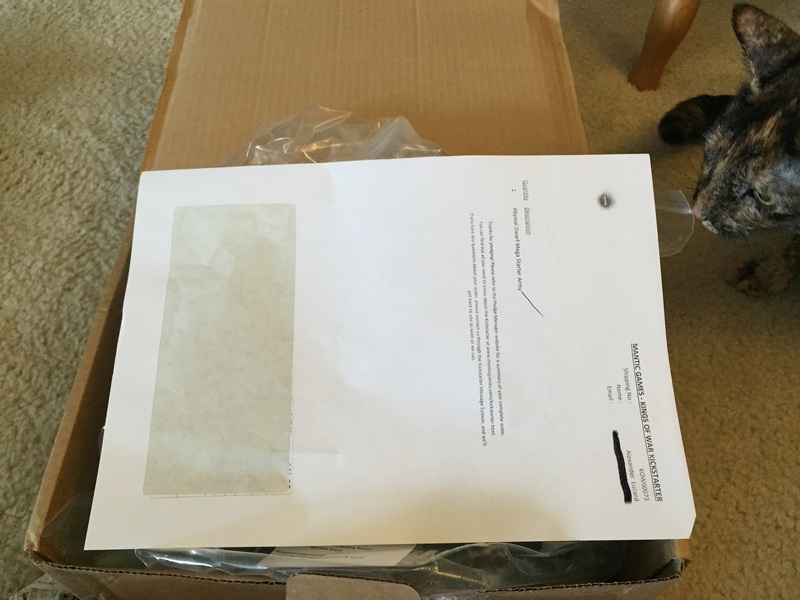 The contents removed from the packing box. 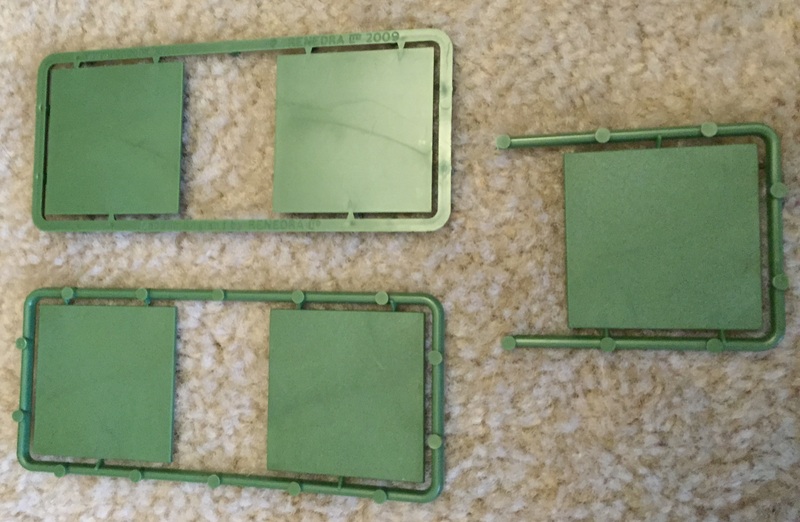 Again, I’m used to sprues rather than pieces all separated out like this. This also explains why I was picturing something bigger packaging-wise in my head. 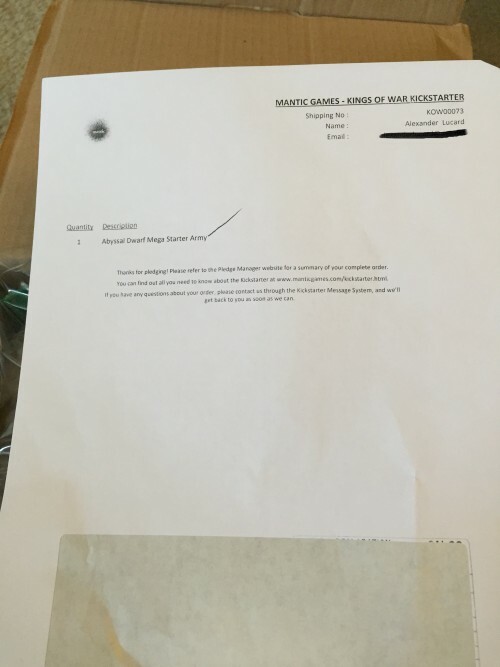 A close up of the packlist that shows everything that is supposed to be in the bag. We’ll follow this list in order so you can see if everything matches up. First, though, we will look at the “bagged separately” piece at the bottom of the list. This is the Great Obsidian Golem bags and its base. It’s a very light but thick plastic. It seems like it will be very easy to put together and, look at it, there are three possible heads and two sets of arms. As this is the only new piece in the set, I’ll do review on the Golem and show you the finished result of the mini. 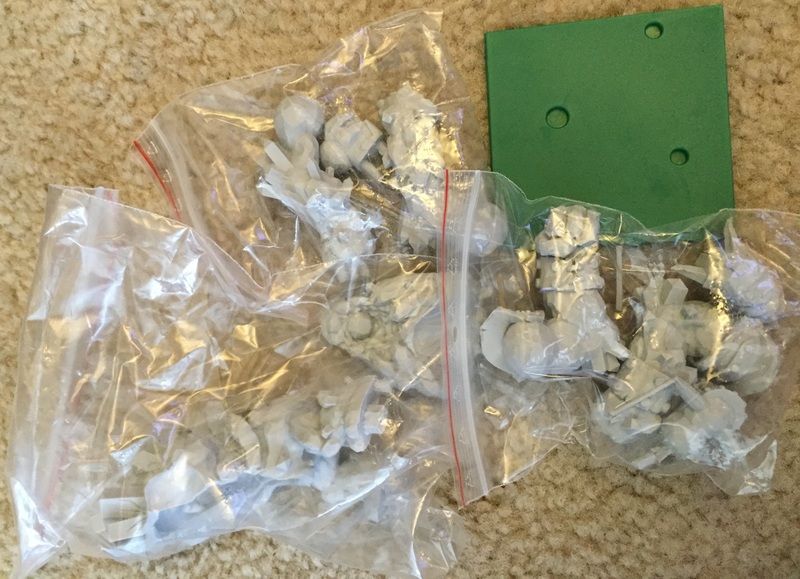 Four bags of Immortal Guard. 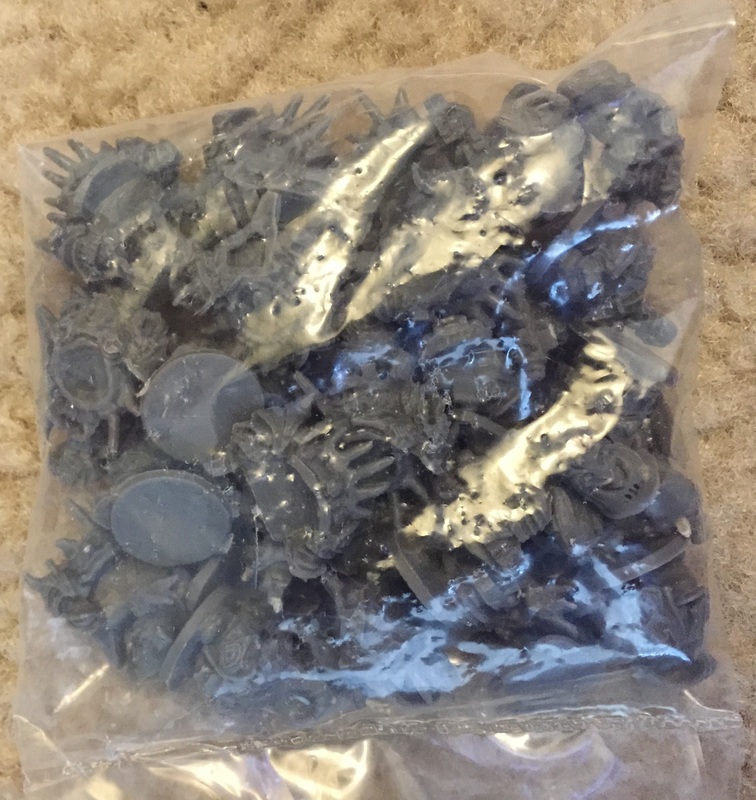 Each bag contains ten Abyssal Dwarves. A close up of one of the Immortal Guard bags. This way you can see all the little parts and the detail on the minis. They’re nowhere as detailed or fleshed out as Games Workshop figures (or a lot of other companies), but what’s here is quite nice for the price. 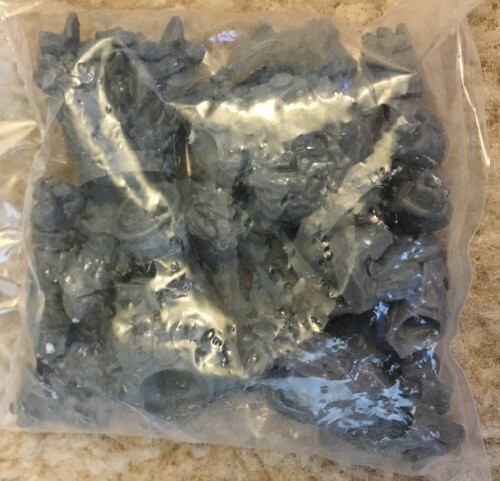 The bag of “Slave Orc Metal.” You can see the hellhound and the Dwarf Handler’s army and head, but the rest of him is missing. 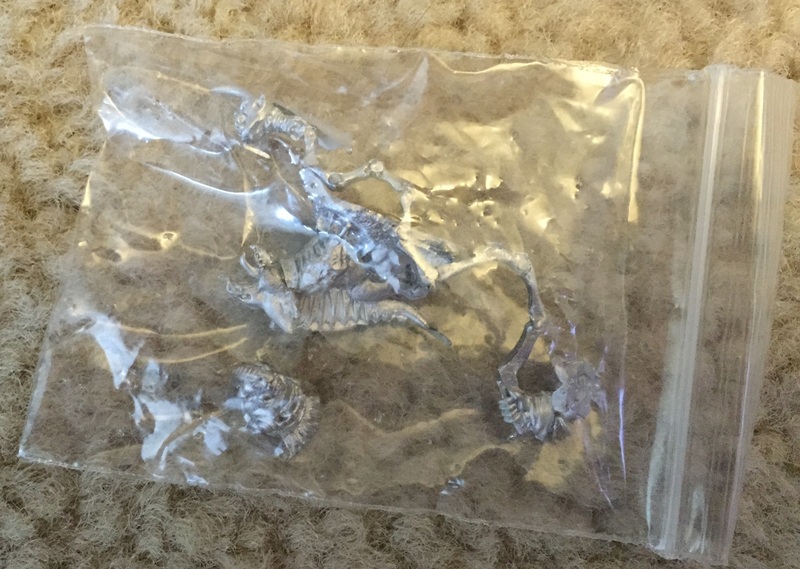 I had to let Mantic know, and hopefully I’ll have parts for this guy in a few weeks. 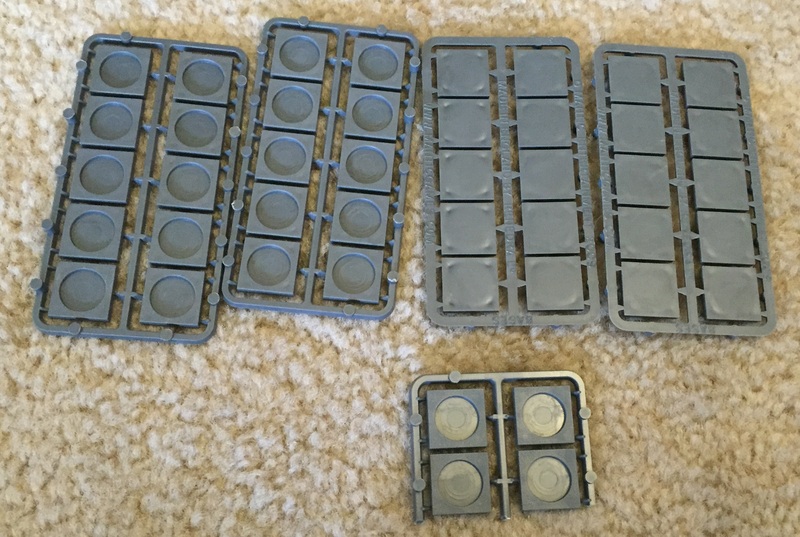 Nine orcs on three sprues. 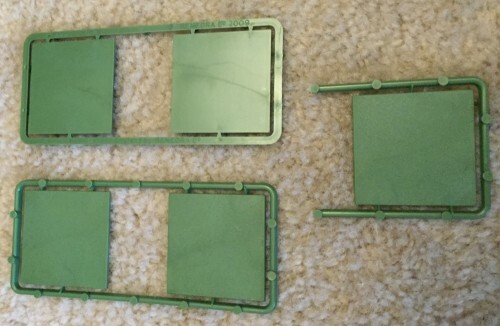 Odd that these are some of the only figures on sprues. The Orcs are much thinner and smaller than GW Orcs or Orugs or whatever they are called now. Two bags of Halfbreeds, which are essentially evil Dwarven Centaurs. 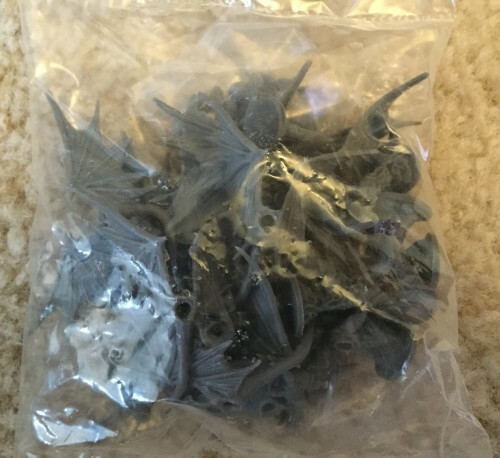 Each bag contains the parts for five figures. At least I hope so. We’ll have to see if anything is missing. Two bags of Angkor Mortar Metal. 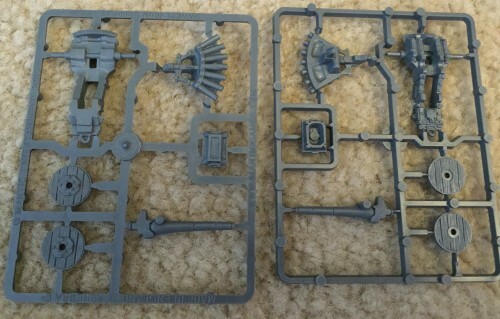 Essentially, these are the parts that differentiate the Abyssal Dwarf weaponry from the regular dwarves. Two sprues of the Ironbelcher cannons. 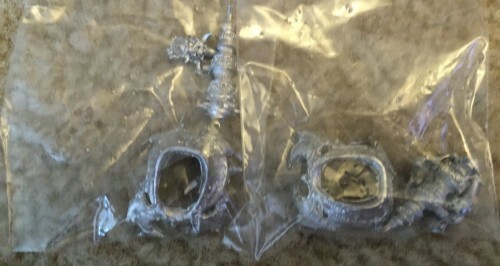 Again, these are regular dwarf army pieces, so I ASSUME that you just mod them with the metal rather than me receiving the wrong parts since Abyssal Dwarves are supposed to have Angkor Mortars. Two Sprues of Ironbelcher Crew. 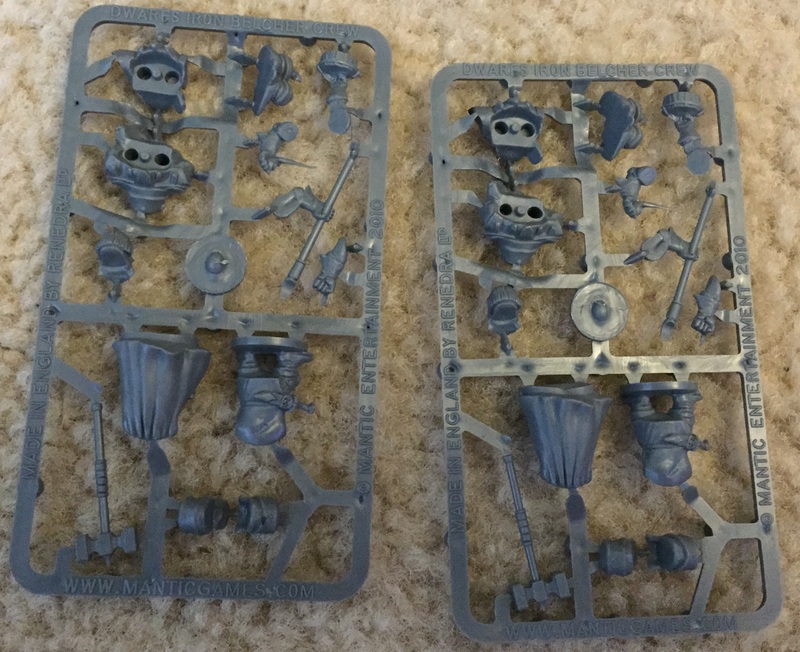 Now these look nothing like the Abyssal Dwarves I’m supposed to have, according to the Kickstarter page, so again, I’m starting to suspect I have some Regular Dwarves accidentally mixed up in my army. The packing slip corresponds to these sprues, but considering how different the Abyssal Dwarf crew is supposed to look, there is obviously a foul-up somewhere. Finally, our last set of figures on the packing slip are these three Lesser Obsidian Golems. These should be fun to put together. Now let’s look at bases. 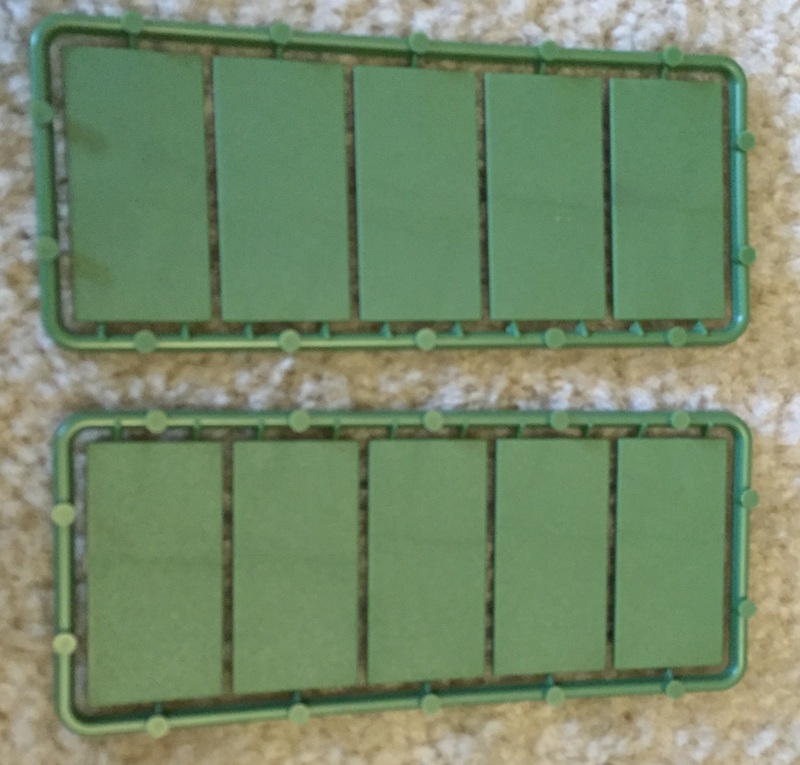 44 x 20 mm square bases. 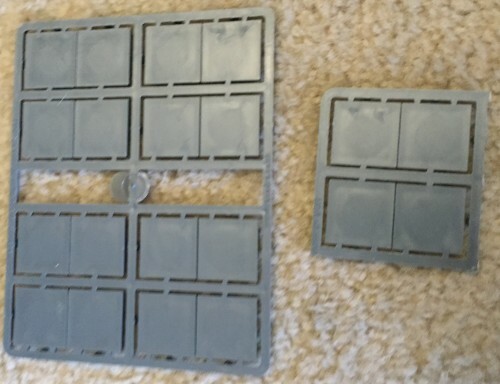 20 x 25mm square bases. 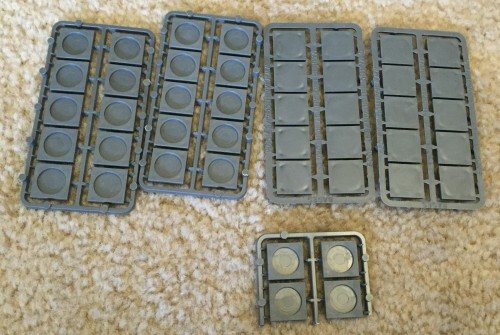 10 25mm x 50mm cavalry bases. So there you go. That’s everything you should getting with an Abyssal Dwarf Mega Army, give or take the missing pieces of the Slave Handler and the mix-up of mortar crew figures. You get 76 figures in this army. Considering Kickstarter backers only paid $100 for that, this is an incredible deal. 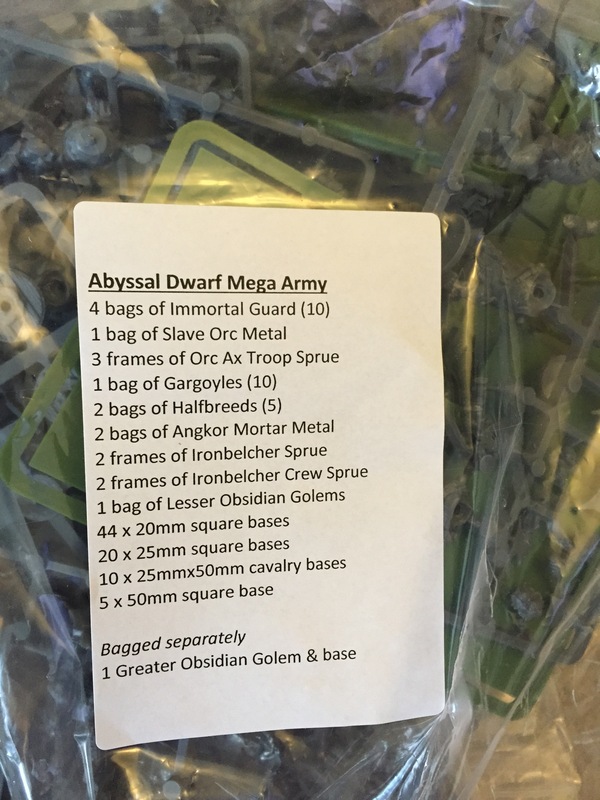 The Abyssal Dwarves (along with the Ogres) are also the smallest of the Kickstarter Mega Armies, so if you ordered something else, you’ll be getting a lot more figures, and thus a bigger box at your doorstep. That’s not even including the add-ons. Hopefully this was of interest to you. 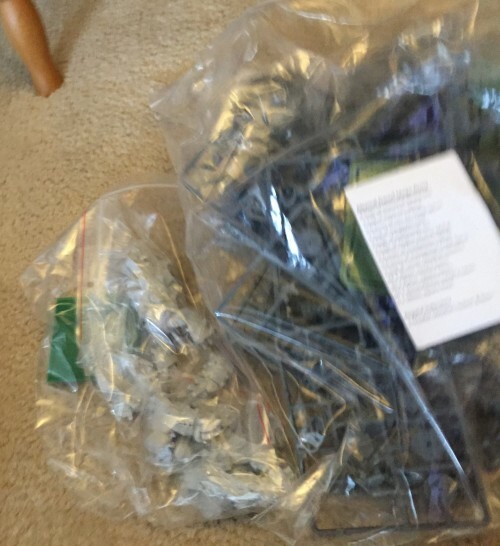 I’ll start putting together the Greater Obsidian Golem first and work my way to the other pieces. Maybe I’ll even get some done by the time the Undead and Basileans arrive!